The next meeting of the Society takes place on Thursday 13th May 2010 at 7:30 pm in St. Andrew’s Church, Bilston Street, Sedgley. The short Annual General Meeting is followed by a presentation - The Longbow. Mark Cooper, secretary of the Bowmen of England Archers, is telling the story of a famous English weapon of war and bringing along modern longbows and arrows. This promises to be a fascinating evening and should hit the target with members and visitors. Find out more about the Bowmen of England Archers here. We asked if you could identify the location of this postcard scene from just outside the Sedgley Manor boundary (a stark reminder of damage caused by industrial activity in the C19th and C20th). 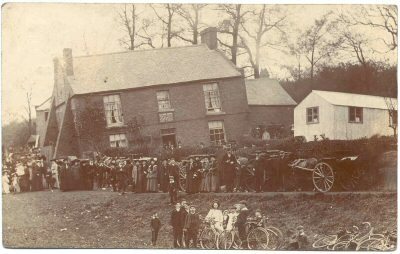 The postcard, from around 1900, shows Himley’s Siden House [an old Black Country name for sunken house], earlier known as the Glynne Arms [after Sir Stephen the landowner] and today called The Crooked House. Built in 1765 [a disputed date] as a farmhouse it acquired its tilt in the mid C19th when coalmine workings collapsed. Life as a pub started around 1850.